Excerpts from Sinfonia Toronto's 2015-16 season opening concert on October 24, 2015 Sinfonia Toronto / Nurhan Arman, Music Director Dmitri Levkovich, Pianist Beethoven: Piano Concerto No. 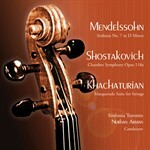 1 Airat Ichmouratov: Chamber Symphony No. 4 Recorded live at Toronto Centre for the Arts, Toronto, Canada.